Health Nutrition Tips Blog,Healthy Drink,Healthy food,Healthy Nutrition,Nutrition,Reviews Are Super Green Foods Really Super? Are Super Green Foods Really Super? Wheat Grass: As the name implies comes from sprouted grains. Taking shots of wheat grass like you would if you were taking shots of vodka is extremely popular in places like Manhattan and California. I remember working out at a very trendy health club located on the Upper West Side, where people would actually line up out the door for this stuff. One day after a hard exercise session the owner finally convinced me to give it a shot, I accepted. To my surprise they were right!! I definitely felt different? But not the kind of difference I would pay money for. My stomach was upset for hours, along with a horrible case of flatulence and the flavor tasted pretty much like I thought it would, like liquidized grass! Many health food stores often make the grandiose statement that 1 ounce of wheat grass is nutritionally equivalent to 1 kg (2.2 lbs) of green vegetables. That’s a 1:35 ratio! No wonder I had so much gas!! The actually numbers from the USDA when comparing wheat grass with broccoli and spinach demonstrate that ounce for ounce there is nothing substantially different from the 3, (see table 1). Looks like Popeye was right! Just eat your spinach kids. Nutrient comparison of 1 oz (28.35 g) of wheat grass juice, broccoli and spinach. 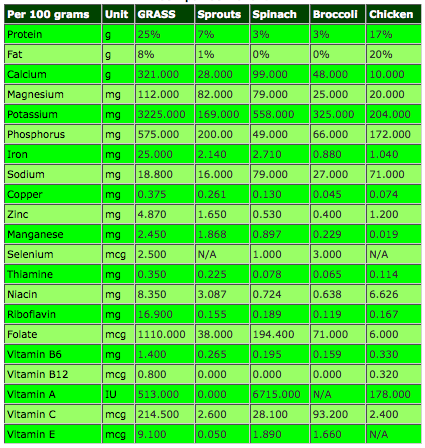 Data on broccoli and spinach from USDA database.Data on Wheatgrass juice from indoor grown wheatgrass. Blue-Green/Algae/Spirulina: organisms containing blue pigment and chlorophyll that habitant seas and lakes. They provide a major source of nutrients for fish and amphibians. Did you ever notice how perfectly divided the earth’s resources are between man and animal? My guess is unless you have gills there is no reason to think there are any benefits from eating algae. These substances contain toxins called microcystins that can be harmful to pregnant women and children, gee I wonder why?
? Chlorella: More algae goop. Chlorella has the highest chlorophyll levels of all the super greenies already mentioned. The Chlorophyll molecule is very similar to human hemoglobin. This in theory (a lot of theory here) will aid in blood flow and help detoxify the body. Sorry but the broken record is about to play again: THIS IS NOT SUBSTANTIATED BY RESEARCH. Exercise has been proven to be one of the things that actually increases plasma volume. More volume means the blood is more dilute and less likely to cause platelet (disc shape cells that form blood clots) stickiness. Sedentary people have thicker platelets which through time can form blood clots in blood vessels and cause heart attacks or strokes. Translation: active people have a lower risk of heart disease and strokes. One of the reasons for this is because they have less sticky blood, and it’s not because they drink Chlorella. Your best bet is to go for a brisk walk right past that long line at the health food store and keep going for about 30 min. There are so many different kinds of healthy, edible, vegetables; you have no reason to spend additional money on these on items. Just go to the local grocery store and enjoy!